You’re touching the tip of a big iceberg, actually. Regardless of operating system, somewhere there’s a table of file types and what applications can handle or display thoat content. Whether it’s a “.MKV” video file, a “.PPT” presentation file or a humble “.HTM” Web page, each type — and often, each filename suffix — has an associated program that “owns” that particular kind of content. Usually it’s invisible and you don’t much think about it. Double-click on a “.DOC” file and it’s opened up in Microsoft Word. Double-click on a “.MOV” and Quicktime launches. No worries. When things break, or when it’s simply the wrong program and you’d prefer another be used, that’s when it gets problematic. 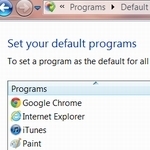 Some applications are smart enough to check and ascertain that they’re not the default app for a file type that they should own (like a video player set up to deal with “.avi” files) and can prompt you to pick them as the default, but other times there’s an inherent conflict, as you are seeing with two Web browsers. According to Microsoft, Internet Explorer should be the default for all Web-related content, but you prefer Google Chrome as your browser. So how do you fix it? Ask Dave Taylor ask dave taylor, Chrome, Firefox, IE, internet explorer, Microsoft Windows 7, Windows 7. permalink. Bob Rankin: Warning, Danger: Botnets!